The Papua Insects Foundation has the ambition, in cooperation with biology students in Papua Indonesia and entomologists, to do research at the insect fauna of Papua Indonesia to be able to recognize important and vulnerable areas of high biodiversity (hot spots). These so called biodiversity "hot spots" are in very high need of protection. 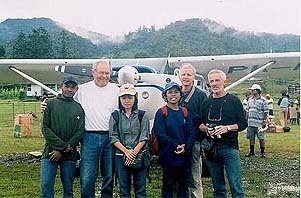 By this way we hope to participate in the protection of the rainforests. Well known organisations like World Wildlife Fund and Conservation International already endeavour for protection of the tropical forests worldwide, but they are mainly focused on larger animals. The Papua Insects Foundation wants to provide these and other organisations with information on areas of endemism, biodiversity hot spots and faunistic and taxonomic information concerning the insects of Papua, to be stronger in the struggle for the protection of the rainforests in Papua. We encourage and support local universities and biology students to participate in inventory and other research projects on insects. As part of the Papua Insects Foundation, the aim of this website is to provide organisations, scientist, students, museums and everyone interested, with actual information on the taxonomics and faunistics of the insect fauna of Papua. This includes checklists with the latest nomenclatorial views, pictures of the species, distribution maps (compiled from information as far as known from literature and collections) and a list with relevant literature. If available we will also give information and photographs of the types. Very important is to distinguish so called biodiversity hotspots, places or areas where the entomological fauna is of a very high species richness and is therefore of great importance to nature conservation. In order to actually recognize these hotspots it is necessary to inventorise the insect fauna and have a knowledge about the existance and identity of the species. 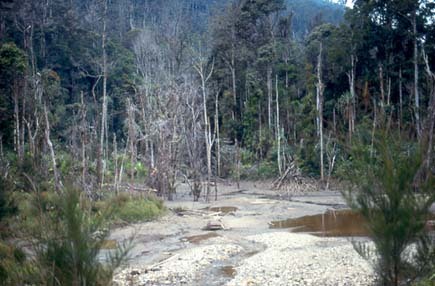 The Papua Insect Foundation can be of help in this matter. Information of some insects orders or families may not always be complete, due to uncertainties or simply because no (recent) work on these taxa is done yet. On the other hand, the taxa which are represented in detail on this website are recently thoroughly revised or studied and the information given is scientifically certified or at least expected to be so. The contributors of this website themselves are scientists or are in contact with specialists all over the world. One of the most urgent job's is to generate checklists of the families and present known species. This can be done by recording relevant literature and collections. The information derived from literature must be trustworthy and will be checked, if possible, by still existing material and photographs. Collection information should be correctly identified or will be reidentified by the specialists. The intention is to give a picture of all species, adults and if possible also immature stages. A distribution map of the species is given for Papua, together with information of its outer Papua distribution. If known, biological and ecological information is given for the species, together with pictures of the biotopes. New discovered species will be described in scientific magazines and only be added to the list when published. Additional research and inventories are needed to complete the distribution maps and the knowledge of the biology and ecology of the Papuan insects and the biodiversity hotspots. Fund raising will be an essential activity to make it possible for local students and entomologists to investigate explored and unexplored areas of the immense forests and mountain ranges of Papua Indonesia. These funds are also necessary to finance publications and other expenses. Rob de Vos is specialized in tigermoths (Lepidoptera: Arctiidae) of Southeast Asia in general and of New Guinea in particular. He is curator of the moths (Lepidoptera, Heterocera) in the Naturalis Biodiversity Center (NBC) in Leiden. Rob is also the webmaster of this website and the chairman of the Foundation. Siep Sinnema is specialized in Uraniidae (Lepidoptera) from Southeast Asia. Siep is the secretary of the Foundation. 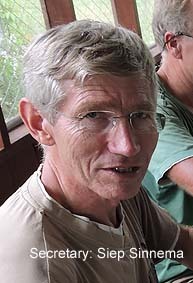 Gerrit Withaar is specialized in longhorn beetles (Coleoptera: Cerambycidae) of Southeast Asia, with special interest in New Guinea species. Gerrit is the treasurer of the Foundation. 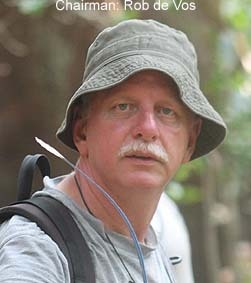 Piet Zumkehr is specializing in microlepidoptera, especially Tortricidae (Lepidoptera), and leaf miners. Apart from that he is a bird spotter, also in New Guinea. He has a great knowledge of ecology. 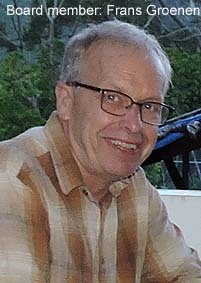 Piet is a member of the board of the Foundation. 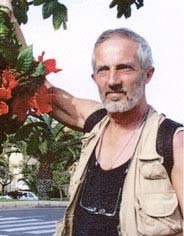 Frans Groenen is specialized in Tortricidae (Lepidoptera). 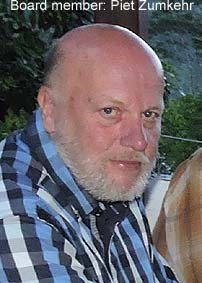 Frans is a member of the board of the Foundation. 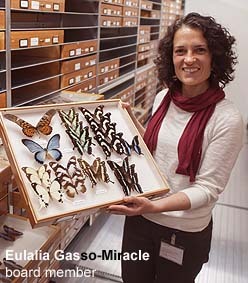 Eulalia Gasso-Miracle is curator of the butterflies at Naturalis Biodiversity Center (NBC) in Leiden (Lepidoptera: Rhopalocera). She has experience with scientific photography, digitalization and will support a cooperation with international institutes and organizations. Eulalia is a member of the board of the Foundation. 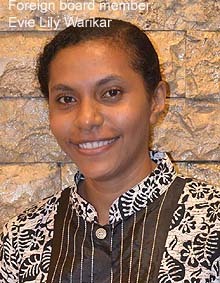 Daawia Suhartwan (UNCEN, KSP-collection) is foreign member of the Foundation. 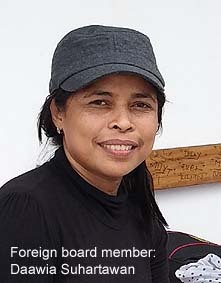 Evie Lily Warikar (UNCEN, KSP-collection) is foreign member of the Foundation. Entomology is our hobby and partly also our profession. In order to collect information we visited many private and museum collections, contacted other specialists, studied relevant literature and publish in scientific magazines. We felt the need of making this and more information available to the public, because it is usually scattered in all kinds of magazines and collections, well known or not, or yet still unpublished. In some cases literature is hard to find or the existance and location of types is not stated. Whenever possible we present the information needed for further study. But we can also be a source of information for students and others interested in Papua. The pages on several areas in Papua are presented in about Papua and will give additional information which might be of your interest. We are fortunate to be supported by other specialists, who contribute to this website with the information of their insect group. Only information of what we expect to be scientifically certified is recorded here. If you have additional information, or if you are specialized in an insect group occuring in Papua which is not yet presented here, please do not hesitate to contact us and join our website. We will be happy to inform you about the conditions. 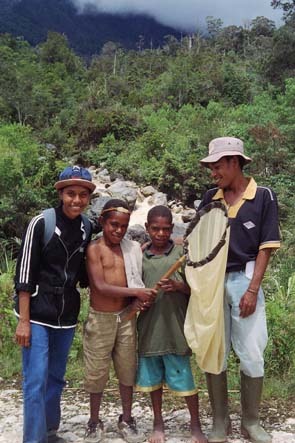 The Uyttenboogaart-Eliasen Foundation (of the Dutch Entomological Society), who financialy supported us to visit museums, publish and make some expeditions to Papua Indonesia, which provided us information for this website. The trustees of the many museums we visited, like the Trustees of the Natural History Museum in London, the Naturalis Biodiversity Center (NBC) in Leiden, Thomas Witt with his large private collection in Munich, and many others we thank for the permission to use information and photographs from their collection material. We thank owners of linked websites and photographs (refered to with or on the photographs), that are relevant to our purpose, for this opportunity to give access to more interesting information. Entomology supplies (entomologie-speciaalzaak) Eddie Vermandel, Poorterslaan 118, NL-4561 ZN Hulst, The Netherlands, who supplied without charge the students of the University of Cenderawasih in Waena, Papua with some important entomological equipment, to do research on the insects of Papua. And finally we thank, of course, all the participants, specialists, students, and other volunteers who made this website possible.